Cake-making defies all the principles of Saving the Best Until Last. Even now, when baking a cake, I find myself taking a silent moment to grieve for those deprived children who, during visits to my mother’s kitchen, confided in me with sticky fingers that their mothers didn’t let them eat batter…I, however, am a Save-the-Best-Until-Last-er in spite of myself, and so must post my feelings about cake-making in reverse. The kitchen air was heavy and sweet for days; even after the cake itself was delivered or devoured, for nearly a week the sugar-butter-vanilla fragrance assaulted unsuspecting bread-box openers and oven users. Pound cake was the only baked item my mother didn’t reserve for special occasions; from time to time I’d arrive home from school to discover the cake platter on the counter, a glass cover tellingly fogged and warm to the touch. Daring to make the initial slice was an expectation-laden responsibility in my home. Whether she was behind the knife or not, my mother hovered like an anticipatory picnic bee to assess the doneness or dryness and buzz a barrage of indignant disclaimers. Servings were evenly dispensed with forks and the occasional afterthought of ice cream or fruit; a reverent silence ritually ensued as we all savored the lavish, buttery sweetness–a yellow, nostalgic taste like homemade whipped cream or housecats sleeping in warm squares of sunlight. Pound cakes were originally called pound cakes because their recipes called for a pound of lard, a pound of sugar, etc. The constituents of my mother’s moderately Revised Version commingled in a cloud of flour, while I wandered underfoot, lapping at a spatula. 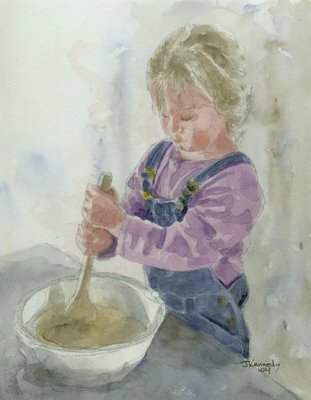 Mother would wipe my face with a dishrag and dab vanilla extract on my wrists, telling me that’s what she and her sisters did when they were little girls. I also happened to know that they slept with egg on their faces and socks in their hair and was thus doubtful about the vanilla, but was nonetheless content to dawdle about, smelling my wrists, waiting for the real thing baking in the oven for ninety long minutes. The oven timer would finally wail, and in a flurry of potholders mother poked at the cake with broom straws. Waiting for it to cool in the pan was agonizing; my hands were ceremonially slapped when I picked at the crust. I’ve got a baker’s dozen more memories of this cake: egg-cracking, bowl-licking, carrying tinfoiled wheels of cake to sick friends and new neighbors; appearances made by the time-honored cake at housewarming parties, funerals, and family reunions; cake rising in the ovens of my four successive homes, my grandmother’s home, my sister’s; the stained recipe card, aged and almost illegible, lost and found again a thousand times. This Pound Cake recipe has been in my family for generations, passed down through Appalachian kitchens and over sticky fingers of children underfoot, to my very own New York apartment! 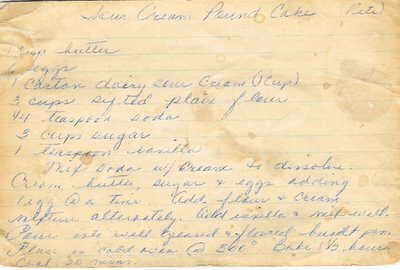 The ingredients are deceptively simple; but it’s better, I swear on my great-grandmother’s grave, than any other pound cake you’ll ever have. Mix baking soda with sour cream to dissolve. Cream butter, sugar and eggs with an electric mixer on medium speed, adding one egg at a time. Add flour and sour cream mixture alternately; add vanilla and mix until well-blended and smooth. Pour into greased and floured pan. Place in cool oven and bake at 300 degrees for 1½ hours. Cool for 30 minutes before removing from pan. Despite that I just ate about 15 courses at Weinstein with the rest of the grassroots gang, your blog has made me hungry again. Lori clued me into your site. I can picture your kitchen and your mother, and it is only a smile away to see you helping her make this cake. It sounds wonderful. And the cake is probably equally as wonderful. Hey Kate, I'm the other Kate from North Carolina and I wandered here from the AT site. I just made 2 sour cream cakes in loaf pans for my son to take to my daughter in NY, flying up for a weekend.visit. He set down the carry on bag to run back in the house to get some money and Darn! the pet goat found them. Good thing I made two, he didn't have time to damage both. I make sourcream poundcake for all occasions. Yogurt gives it a nice fresh taste and I use different flavorings and nuts sometimes. I liked reading the chicken and dumplings recipe we called it chicken pastry and it was a childhood favorite. Some people call it slickem. I,m a Taurus too. Dinner in the Dark...Who's With Me?